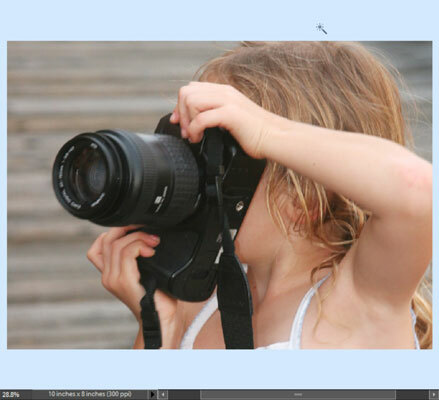 When you scale images in Photoshop Elements 11, you maintain the same canvas size. You might (for example) have a canvas size set up for printing a photo — say, 8 x 10 inches — and want to make an image a bit larger on the canvas. You might also add other images to create a photo collage and need to scale those added images up or down, again keeping the same canvas size. For that matter, you might want to keep the image size the same but increase the canvas size to accommodate an area to include type, some content from the Content panel, or additional images. 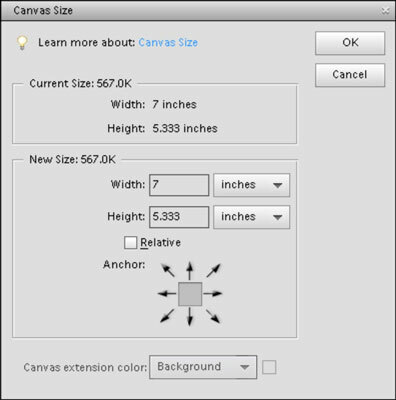 Current Size: The display for the Current Size shows you what your original canvas size is when you open the dialog box. Width: Type the new width in the text box. Height: Type the new height in the text box. Relative: By default, the new size is absolute. Select this check box if you want the new size relative to the dimensions. Anchor: By default, the canvas is increased from the center out. For example, if you have a 3-x-3-inch canvas area and you increase the size to 5 x 5 inches, 1 inch of canvas is added to all four sides of the photo. By clicking an arrow in the Anchor area, you can size the canvas relative to the photo from the top-left corner, top, top-right corner, left side, right side, bottom-left corner, bottom, or bottom-right corner. Canvas Extension Color: From the drop-down list, you can choose the current background, foreground, or some preset values for the color of the new canvas area. If you want a custom color, click the color swatch to the right of the drop-down list and make a new color selection from the pop-up color wheel. In the following figure, some canvas area has been added to make the total size of the photo 8 x 10 inches. The new canvas color specified in the Tools panel is the same color as the background color.